I’m delighted that a poem of mine will be included in the Monster Verse, Poems Human and Inhuman anthology, to be published by Random House on September 15th, 2015. The anthology is edited by Tony Barnstone and Michelle Mitchell-Foust. Monster Verse is both a delightful carnival of literary horror and an entertainingly provocative investigation of what it means to be human. 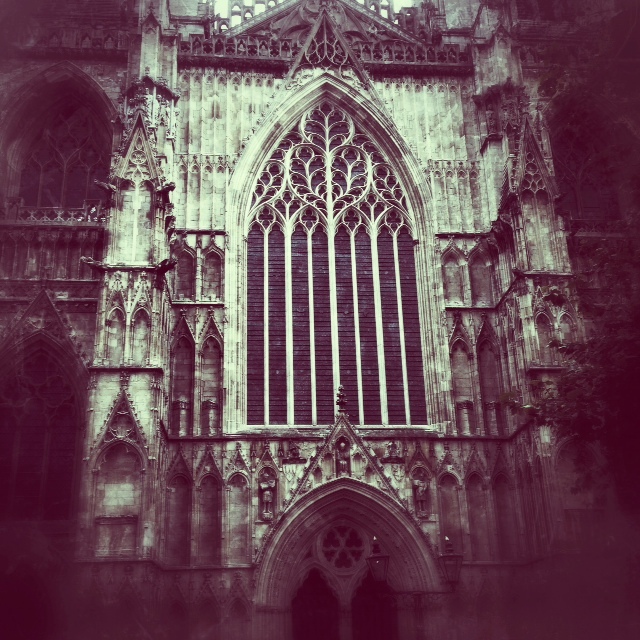 The York Minster. Taken with my iphone using Snapseed editing. This year Fantasycon was in York, convenient for me as I live behind the rail station so the con was essentially in my back yard. The popular joke at the con was that York was indeed Winterfell. I confess I went simply because it was close to me– but fantasy is the genre I have always loved and with the embrace of the New Weird, it has become even closer to my heart. The first con I ever attended was GenCon back in 1984. I was a dorky kid who played D&D. I remember trying to disguise my budding womanhood by wearing a man’s shirt and a fedora. I ended up wandering around pretty lonely, not knowing how how to approach the myriad boys and men around me. (I don’t remember any other girls, though there must have been some.) I was shy then, and not much has changed though I no longer wear men’s shirts and fedoras– maybe I should. I still found the social aspect of this recent con daunting. Everyone was chatting in groups– presumably they’d known each other for years, or so it seemed. There was no way to enter into conversations as a lone woman. Or at least i should say I found it daunting. And yet, things have changed. This was my first Fantasycon– since moving to the UK I have regularly attended Eastercon, the BSFA con– and in the last few years I have sold my hand made jewellery in the dealers room under the Feral Strumpet banner, which has helped me fund my trip to the con. What I noticed was that feminism was alive and well in almost all the panels I attended. Challenging questions of inclusion and the purpose of violence against women in fiction where electric, bristling with new ideas. Men and women were voicing complex arguments; inclusion and nixing the misogynist cliches in the genre simply makes for richer stories. Still the statistics are sobering– 50% of fantasy readers are women, yet we make up only 25% of published fantasy writers. These numbers, voiced by Abbadon Editor David Moore in his panel on Grimdark, were repeated in other panels I attended that weekend. There was an urgency to change this, something I had not felt before at any con. Allyson Shaw is a writer, metalsmith and mother of cats living on the North East Coast of Scotland.